Nebraska as a state was admitted to the Union in 1867, almost three years after Nevada. Created as a territory at the same time as Kansas, Nebraska saw most of its settlers arrive as part of the Homestead act. By the time the thousands of new settlers arrived, Nebraska already had a few breweries up and running, ready for their business. When you search on Nebraska Beer History, you will quickly encounter the term “Big 4”. This refers to four breweries: Krug, Storz, Willow Springs and Metz, that were the start of brewing in Nebraska. Each of these breweries formed around the same time in the late 1850s, and were the biggest brewery operations in the state until Prohibition took hold and, as we expect, destroyed their businesses. Of the Big 4, Willow Springs was mostly a distillery, however they were able to hobble through prohibition by brewing near beer and soda. Storz also relied on the near beer, soda and ice during the prohibition era. Finding information on the styles of beer brewed at these breweries has been hard going, but I would expect that in the early years, they brewed either ales or steam beer. I wouldn’t expect the plains region to be a good area for lagering. You wouldn’t believe there was such difference in beers until you use one Krug’s popular brands. They are uniform perfectly brewed and well-aged absolutely pure and leave no bad after effects. The kind of beer that acts as a tonic and a system builder. Order a trial case and begin to enjoy. – Text from a 1910 advertisement by Fred Krug Brewing Company. Oh, and check out this great sign, also from the Krug Brewery. Everyone could use some liquid sunshine. 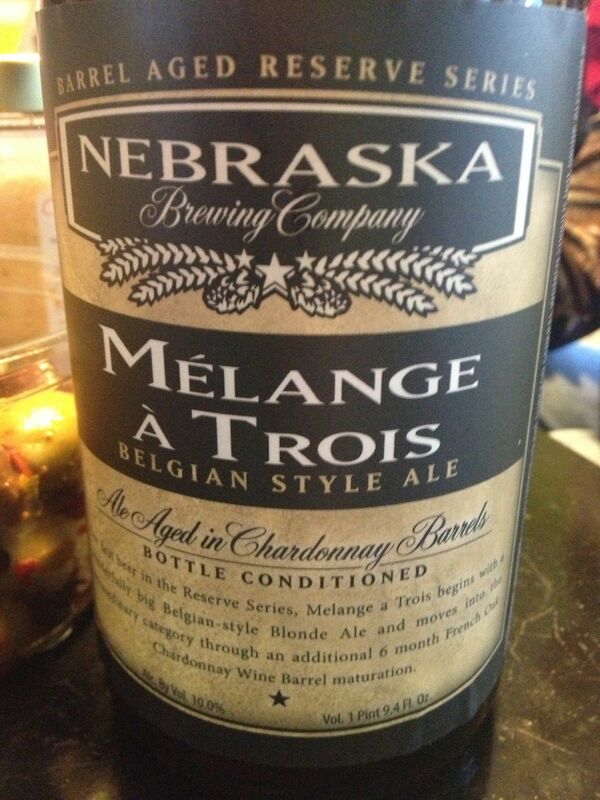 This week, we experienced Nebraska through two great brews from Nebraska Brewing Company. Located in Papillion, on the southern side of Omaha, the Nebraska Brewing Company is a brewpub that also makes one fine bottle of beer. All of the beer available in New England from Nebraska Brewing comes from their Reserve Series. Barrel aged, and bottle conditioned, these beers took some time to brew. 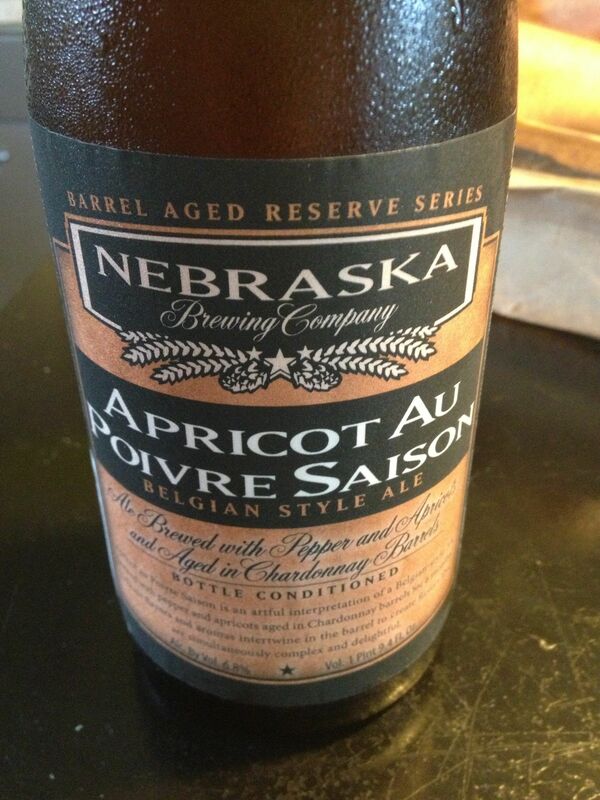 We started the night off with an Apricot and pepper Saison called Apricot Au Poivre Saison. Aged for 6 months in Chardonnay barrels, this beer was delightful. I am not typically a fan of fruit beers, but this one was different. When poured, this beer had a distinct fruity, apricot smell. The mouthfeel was very sparkly and tingly, with a light body and wonderful taste. It reminded me of a champagne. This was definitely the best apricot beer I ever had. The other tasters agreed. After the experience of the Apricot, we decided we needed another brew from this brewery, so a quick trip to our local beer shop and we had a bottle of Melange A Trios. The beer had the smell of grapes, clearly something it picked up during the aging process. In the glass, the beer was light in color but the mouthfeel was completely different, with a more thick body which gave this beer a surprising twist. Both of these brews from Nebraska were not cheap, but considering the time it took to make them, it should not be surprising. If you have not tried anything from this brewery, I recommend you check them out, they are more than worth the price. That covers our 37th state. Next week, we dip southwest into the state of Colorado.